Before virtualization support was available on CPUs, virtual machines were emulating most of the code that a guest OS would run. With VMX, the CPU handles the virtualization. If you are familiar with the hardware context-switches that were available on ia32, it's a bit similar. The hypervisor manages many VMs. When executing code of a VM, there is a hardware context switch that occurs. The context switch saves the current CPU state (but not the general purpose registers) and loads another state that would be the one of the VM. Then code can execute from there. So the VM ends up running "bare-metal". The CPU has changed it's entire context and runs your VM just as it would if the guest was running bare-metal. With one exception: Some operations causes VMExits. For example, when an interrupt occurs, the CPU automatically switches back to the hypervisor context (what they call the VMM). The VMM can then handle the interrupt and change the Guest's state data so that on the next entry it will think it has an interrupt to handle (or not). This is basically how you would handle the timer interrupt on the guest and on the host so that multithreading works. VMExits occur for many other reasons. You could have a VMExit occur when the VM tries to access unmapped memory, when executing "hlt" or many other reasons. The virtual environment we'll be setting up is for a 16bit real mode VM because that's how a real CPU would start. Control will initially be transfered to address 0x00000000. Normally, an entry point to BIOS code should be located there and then the BIOS would eventually load the first sector of the primary HDD and transfer control to 0x7c00. But in my case, I am not writting a BIOS, so only test code will be executed in the VM. Guest virtual memory: The guest's virtual memory if paging is enabled in the Guest. That memory translates to guest physical memory using the guest's paging structures, entirely controlled by the guest. Guest physical memory: This is the physical memory from the VM's point of view. From the hypervisor's point of view, this is just virtual memory that has to be mapped to physical memory. This memory would be allocated lazily as the VM uses more and more memory. This memory is mapped to physical memory by the hypervisor. Physical memory: This is the real hardware physical memory as seen by the host's CPU. 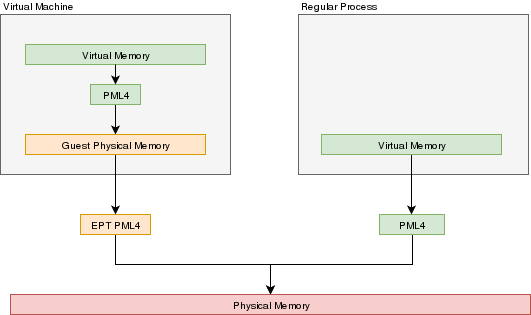 For the VM to have memory, some of the host's physical memory must be assigned to the VM. The guest's physical memory is seen as virtual memory by the host. To assign memory to the guest, a feature provided by the CPU called "EPT" can be used. EPT works Just like the regular paging system. It is a way to map guest-physical addresses to real physical addresses using a paging structure with a PML4 table on top. So a guest would prepare it's own internal paging system and have it's own PML4 table. When an a virtual address inside the VM needs to be resolved, it will be resolved to the guest's physical address using its PML4 table. Then, the guest-physical address will be resolved using the EPT's PML4 table. So 2 translations would be done. When a guest is launched with, for example, 16gb of ram, it would not be desirable to reserve that entire memory on the hypervisor immediately. Instead, it would be preferable to allocate that memory in a lazy allocation fashion. A guest might never use it's entire RAM so reserving it on the hypervisor would be a waste. Reading an unallocated guest physical page will return zeros. Writing to it will trigger a EPT violation. The VMM can then reserve a physical page and map it there instead of the dummy page. When the guest is launched, a single page of write-protected physical memory (filled with zeros) should be mapped to all the guest physical memory. If the VM's BIOS starts probing memory by reading all of it, every 4k would be mapped to that single page so the BIOS would read zeros and think it is reading valid memory. If the BIOS (or the guest OS) writes into memory, a VMexit would occur because writing to any address would map to this write-protected physical page. The hypervisor can then allocate a new R/W page to the EPT's paging structure for the guest physical memory. Of course, if the guest does a write/read-back kind of algorithm the probe the memory, then all the guest physical memory will have been allocated because all pages will have been written to, so all bets are off. Reclaiming freed-up memory is a different story. The only way the hypervisor can know about memory that can be reclaimed is by using memory balooning. The virtio specification describes a memory baloon device that can be implemented for that purpose. When the guest will access guest-physical memory that is unmapped to physical memory, a VMExit will occur. The hypervisor needs to evaluate if the guest-physical address falls into the possible addressing space of the VM (i.e. if it is trying to access memory beyond the last byte of the virtual RAM). If the memory is unmapped because of the lazy-loading scheme, then a new page can be allocated. If it is because that memory address should not be mapped, then an exception will be injected back in the VM and the guest will need to handle that. All guest-virtual/guest-physical mappings (of all VMs). This could create collisions in the TLB. For example, 2 VMs could have a mapping of virtual address 0x00000000. A simpler case would be two processes with different virtual memory mappings running on the host. For this reason, as I described in another article (Process Context ID and the TLB), the TLB supports processID-tagging. With VMX, two new taggings exist: VPID and EP4TA. 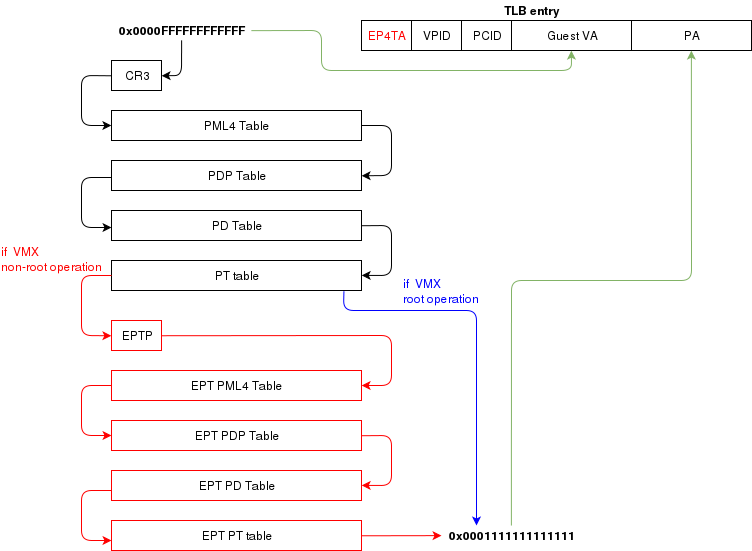 VPID is the tagging of a TLB entry for a specific virtual CPU. This is only tru if VPID is enabled in the VMCS and if a non-zero VPID has been set in the VMCS. In such a case, every guest-virtual to guest physical translations that are inserted in the TLB will be tagged with the current VPID. This means that another VCPU can insert a similar entry in the TLB and it will be tagged with a different VPID. When the MMU looks up a mapping in the TLB, it will only consider those tagged with the current VPID. EP4TA tagging is done when EPT is enabled. Every guest-virtual to host-physical (going through EPT tables) are cached in the TLB with a tagging of the current EPT,PCID and VPID. The EPT ID (EP4TA) is derived from the current EPTP, so there is no specific ID to set, unlike PCID and VPID. If VPID is not enabled, then the VPID tag is always 0 and is always ignored during lookups. A lookup while EPT is active (during non-root operation) will only consider entries with a matching EP4TA. entries will be tagged with VPID=0. On vmexit/vmentry, all entries with VPID==0 will be invalidated, regardless of EP4TA tag. For this reason, I am enabling VPID with a tag of "1" for all my VCPUs. The documentation clearly states that having the same VPID for different EPT is acceptable. When the guest will invoke "invlpg" or "invpcid", these instructions should be trapped because they will invalidate all requested TLB entries regardless of the current EP4TA. So the VMM should set a VMExit on those operations and emulate them using "invept. That's what I am understanding from section 28.3.3.1, but section 28.3.3.3 says that when EPT is enabled, there is no need to emulate these instruction. When a VMExit occurs because of an EPT violation, the faulting page will always be invalidated in the TLB. In my OS, I use the EPT violation handler to allocate more memory to the VM. When the VM resumes, the TLB will be up to date the VM will be writing data in the correct physical page. If the VM is rescheduled on another core where the stale TLB entry exists for that address, then it will be accessing the wrong physical page. The TLB was only invalidated on the CPU that detected the EPT violation. For this reason, the host needs to do a TLB shootdown on all host CPUs. This done by sending a IPI to all other CPUS. The CPUS will then execute "invept" to invalidate TLB entries associated with the EPT in question. The "invept" can be used to invalidate ALL tlb entries tagged with a specific EPT, or all EPT. It's important to note that VMXON should be executed on all CPUs and this should be done when the hypervisor starts. In my OS, I do this as soon as I switch to long mode on all cores and I leave it on all the time. The tricky part is to get the VMCS for the guest initialized correctly. I had to spend quite some time fine-tunning the fields. If VMLAUNCH fails, the zero flag will be set, then you can do a VMREAD to VM_INSTRUCTION_ERROR to get the error code. Then, the SDM (chapter 26) describes all the checkings that the CPU does so you can walk through those and make sure your code is compliant. Also, it seems like access rights and segment limits for guest segment descriptors still need to be properly set even if the VM will run in real mode. If I recall correctly, it's because they will be checked even in real mode and that is how "unreal mode" works. I am not going in the details about this because everyone talks about that and the SDM has very good documentation about it. Running a VM in a multitasking environment requires a bit of logic that is beyond that the Intel manuals describe. This is because a VM really is just a process getting a time slice with the scheduler. So when the process is scheduled out, the entire VM is paused. Every VCPU is managed by one and only one thread in the OS. So each thread has a VMCS (if it is running a VCPU) Before the task get's scheduled out, vmclear is executed so that any cached data gets flushed in the VMCS. At least that's what Intel recommends to do. When a task is scheduled back in, VMPTRLD is executed to load the VMCS (if any) that this task manages. When the VMM is running in root-operations because of a VMexit, it could have been scheduled out at any moment before doing the VMRESUME. So when VMRESUME is executed, it is possible that VMCLEAR was executed before because of a task switch. For this reason, the OS checks if VMRESUME fails and executes VMLAUNCH instead. The OS should avoid scheduling VCPUs from cores to cores because moving a VCPU to another core makes it mandatory to do a VMCLEAR. My OS does not make such effort and blindly does a VMCLEAR on every task switch. So performance could be improved there. When the cpu is running in non-root operation (running VM code), it's pretty much as if the VM was running bare-metal. But Several events can make the VM exit back to root-operation (the hypervisor). 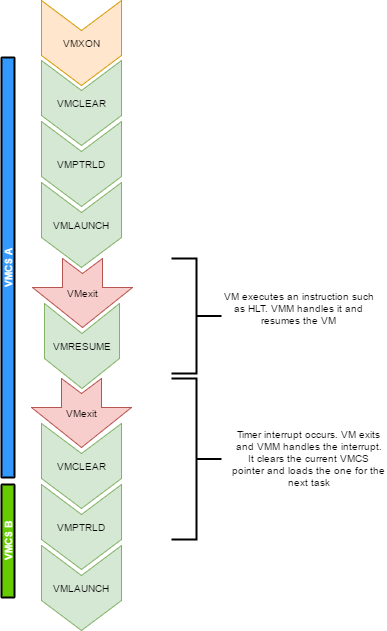 A VM exit will restore the CPU state back to what it was set in the VMCS before vmlaunch. The hypervisor must determine what caused the VMExit and take proper action. VMExits are similar to interrupts because the general purpose registers are not automatically saved. A VMExit handler must save the registers and restore them before resuming the VM otherwise the VM will be corrupted. As per the host section of the VMCS though, a separate stack is being set. The VMM could alter the VM state by changing data in the VMCS before resuming the VM. For example, if the VMExit occured because of an exception of type #UD, the VMM could emulate the invalid instruction and change general purpose registers and flags in the VM. When an interrupt needs to be delivered to the host, a VMExit will occur and control will be immediately given to the VMM's exit handler. At that moment interrupts will be disabled (flags.IF=0). When bit 15 (Acknowledge interrupt on exit) is cleared on the VM Exit control, the interrupt is not acknowleged by the processor. This means that as soon as the "IF" flag becomes 1 (ie, when executing "sti"), the interrupt handler will get called. In my hypervisor, if such a VM exit is detected, the kernel executes "sti" and finally "vmresume". This will let the host execute the handler as soon as interrupts are re-enabled, then control will be handed back to the VMM exit handler to execute "vmresume"
One thing to consider when running multiple VCPUs is that one of them could trigger a VMExit because of a memory allocation requirement (as described in a previous section of this article). In such a case, another VCPU could be running, or the current thread could get scheduled out with another VCPU one being scheduled in. So extra care should be taken to ensure that memory does not get corrupted. Trapping IO operations so that the hypervisor can retain control over hardware. 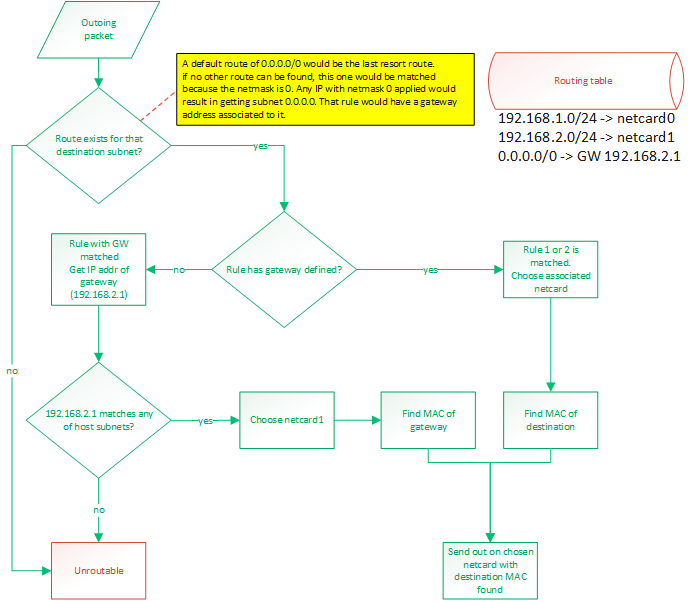 Setup a virtual apic so that VCPUs can receive interrupts (and make a scheduler). There is still some work to be done for implementing a full hypervisor. The work done here only creates virtual CPUs. The hypervisor needs to emulate other hardware such as a hard drive, a network card, a video card, keyboard etc. I would probably write virtio devices since they are easy to code and very efficient. Another big part that is missing is a BIOS. The hypervisor has to provide a BIOS for your guests since they rely on that to boot. I'm not trying to say that this solution is better than LXC or docker. I'm just doing this because it is very simple to get a basic container created with chroot and cgroups. Of course, docker provides much more features than this, but this really is the basis. It's easy to make containers in linux, depending on the amount of features you need. cgroups are a way to run a process while limiting its resources such as cpu time and memory. The it works is by creating a group (a cgroup), define the limits for various resources (you can control more than just memory and CPU time) and then run a process under that cgroup. It is important to know that every child process of that process will also run under the same same cgroup. So if you start a bash shell under a cgroup, then any program that you manually launch from the shell will be constrained to the same cgroup than the one of the shell. If you create a cgroup with a memory limit of 10mb, this 10mb limit will be applicable to all processes running in the cgroup. The 10mb is a constraint on the sum of memory usage by all process under the same cgroup. Note that instead of using cgexec, you could also just write the current shell's PID into /sys/fs/cgroup///task. Then your shell, and whatever process you start from it, would execute in the cgroup. A container is nothing more than a chroot'd environment with processes confined in a cgroup. It's not difficult to write your own software to automate the environment setup. There is a "chroot" system call that already exist. For cgroups, I was wondering if there was any system calls available to create them. Using strace while running cgcreate, I found out that cgcreate only manipulates files in the cgroup file system. Then I got the rest of the information I needed from the documentation file located in the Documentation folder of the linux kernel source: Documentation/cgroups/cgroups.txt. To create a new cgroup, it is simply a matter of creating a new directory under the submodule folder that the cgroups needs to control. For example, to create a cgroup that controls memory and cpu usage, you just need to create a directory "AwesomeControlGroup" under /sys/fs/cgroup/memory and /sys/fs/cgroup/cpu. These directories will automatically be populated with the files needed to control the cgroup (cgroup fs is a vitual filesystem, so files do not exist on a physical medium). The launcher creates a cgroup and sets relevant parameters. The parent waits for the child to die, after which it will destroy the cgroup. At this point, the child runs as per the cgroup's constraints. The child invokes execv with the application that the user wanted to have invoked in the container. The reason I use clone() instead of fork, is that clone() can use the CLONE_NEWPID flag. This will create a new process namespace that will isolate the new process for the others that exist on the system. Indeed, when the cloned process queries its PID it will find that it is assigned PID 1. Doing a "ps" would not list other processes that run on the system since this new process is isolated. So interfacing with cgroups from userland is just a matter of manipulating files in the cgroup file system. It is really easy to do programmatically and also from the shell without any special tools or library. My "container launcher" is a c++ application that chroots in a directory and run a process under a cgroup that it creates. To use it, I only need to type "./a.out container_path". The container_path is the path to a container directory that contains a "settings" files and a "chroot" directory. The "chroot" directory contains the environment of the container (a linux distribution maybe?) and the "settings" file contains settings about the cgroup configuration and the name of the process to be launched. I've extracted the slackware initrd image found in the "isolinux" folder of the dvd. When cloning with CLONE_NEWNET, the child process gets a separate netwrok namespace. It doesn't see the host's network interfaces anymore. So in order to get networking enabled in the container, we need to create a veth pair. I am doing all network interface manipulations with libnl (which was already installed on a stock slackware installation). The veth pair will act as a kind of tunnel between the host and the container. The host side interface will be added in a bridge so that it can be part of another lan. The container side interface will be assigned an IP and then the container will be able to communicate wil all peers that are on the same bridge. The bridge could be used to connect the container on the LAN or within a local network that consists of only other containers from a select group. The launcher creates a "eth0" that appears in the container. The other end of the veth pair is added in a OVS bridge. An ip address is set on eth0 and the default route is set. I then have full networking functionality in my container. Virtio is a standard for implementing device drivers on a virtual machine. Normally, a host would emulate a device like a rtl8139 network card, the VM would detect such a device and would load a driver for it. But this adds a lot of overhead because the host is emulating that device so it must translate the data it receives into a format that is understood by the real hardware. The more complicated the emulated device it, the more challenge it will be for the host to keep latency low. Virtio solves this problem by letting the host expose a Virtio device. A virtio device is a fake device that will be used by the VM. Virtio devices are very simple to use compared to other real hardware devices. For example, a host may implement a Virtio network card. The VM would detect such a device and start using it as its network card. Of course, the end-user wouldn't really notice this. The simplicity of the device is seen by the device driver implementers. So to use Virtio, the host must support it. Currenly, KVM does. Then the guest must install the appropriate device drivers. Virtio device drivers are included in the linux kernel already, so there is no need to download separate drivers. On windows, drivers must be downloaded separately. Virtio can be seen as a two layer device architecture. The first layer is the communication layer between the host and the guest. This is how both exchange information to say "Here's a packet I want you to send on the real hardware" or "Here's a packet I just received from the real hardware". Note that the driver knows it is running in a virtual environment and can implement optimizations in that effect. But the rest of the OS, using the Virtio driver, doesn't know that. It only knows that it is using a network card with a driver like any other ones. Every Virtio device drivers communicate with the host using the same model. This means that the code for this layer can be shared between all Virtio drivers. The second layer is the protocol used over the first layer. Every virtio device use a different protocol. For example, a virtio-net driver will speak differently than a virtio-block driver to the guest. But they would both convey the messages the same way to the host. The reason I was interested in virtio was because my hobby operating system required some device drivers to work. I had already written an ATA driver and a netcard driver (rtl8139) but those are old devices and I wanted to learn something new anyway. By having implemented virtio drivers in my OS, I should, technically, be able to run my OS on any host that support virtio. I don't need to worry about developing several device drivers because different hosts support different hardware. If virtio because a widely accepted standard (maybe it is already), then my OS should be fine on all different hosts. Note that I will still need to implement several different drivers if I want to support my OS on real hardware. But running it in a VM for now is just fine. These are the drivers. Note that, without the full code of my OS, these drivers won't make much sense but I'm putting them here in case someone could use it as an example whenever trying to write such a driver. I'm going to describe the implementation using pseudo-code and will skip some of the basic details. Things like PCI enumeration will be left out since it is out of the scope of this document. The first thing to do is to discover the device on the PCI bus. You will be searching for a device with vendor ID 0x1AF4 with device ID between 0x1000 and 0x103F. The subsystemID will indicate which type of device it is. For example, susbsystem ID 1 is a netcard. 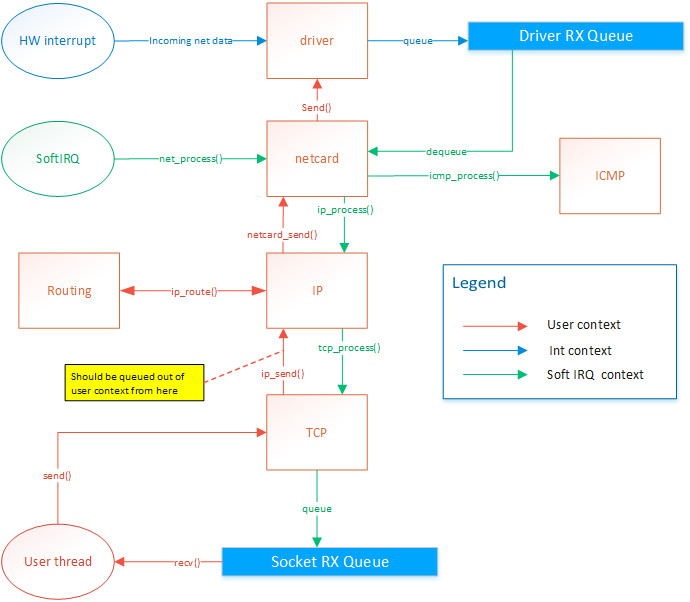 So after finding device on the PCI bus, you will obtain the base IO address and IRQ number. You can then proceed to attaching your device driver interrupt handler to that IRQ and setup the device using the IObase address.. The init_queues() function will discover all available queues for this device and initialize them. These queues are the core communication mechanism of virtio. This is what I was refering as the first layer. I will go in more details about queues a bit later. For now, to discover the queues, You just need to verify the queue size for each queue. If the size is not zero, then a queue exist. Queues are addressed with a 16bit number. For each queue, you must prepare a rather large structure containing information about the queue and slots for buffers to send in the queue. The structure is created in memory (anywhere you want, as long as it sits on a 4k boundary) and the address will be given to the device driver. I find that the structure that is detailed in the spec is a bit confusing because the structure can't really be defined as a struct since it has many elements that must be dynamically allocated since their size depends on the queue size. The way the driver talks to the device is by placing data in a queue and notifying the device that some data is ready. Data is stored in a dynamically allocated buffer. The buffer's physical address is then writen to the first free buffer descriptor in the queue. Buffers can be chained, but forget about that now (it will be usefull when you want to optimize). Then, you need to tell the device that a buffer was placed in the queue. This is done by writing the buffer index into the next free slot in the "available" array. BTW: it's important to know that queue sizes will always be powers of 2. Making it easy to naturally wrap around, so you never need to take care of checking bounds. To receive data, you would do it almost the same way. You would still place a buffer in the queue but you would set its lenght to the max size that you are expecting data (512bytes for a block device for example, or MTU for a net device). Then you would monitor the "used" ring to see when the buffer has been used by the device and filled up. The MAC address can be found in the 6 bytes at iobase+0x14..0x19. You must access those bytes one by one. To receive packets, just fill up the rx queue with empty buffers (with lenth=MTU) and set them all available. It's important to set them back available after you received data in it (ie: they've been added in the used ring) since you want to keep the queue full of ready buffers at all time. I didn't talk about buffer chaining (it's very simple, and well described in the spec) but you should obviously use that. You could use one buffer for the header and another one for the data. You could use the address of the data buffer supplied by the calling function in the descriptor directly (as long as you convert it to physical address) instead of copying the entire frame. This allows you to implement a zero-copy mechanism. To write, fill the header with type = 1, sector = sector number to write. Followed by the 512 bytes of data and send the buffer. To read, fill the header with type = 0, sector = sector number to read. Followed by a 512 bytes empty buffer. The device will fill the buffer and will put the buffer descriptor in the used ring. I think you need to separate the header and the data buffer into 2 descriptors that are chained. That's the way I did it anyway, but I think I read that it won't work if you don't do that. This was a very rough explanation of virtio but it should be enough to get you started and have something working. Once this is done, I suggest going through the specs again since it has a lot of information what will be needed for handling failure scenarios, optmization and multi-platform support. The driver I wrote works for my OS only and has only been tested with KVM. I am not doing any real feature negoiation nor am I handling any failure cases. Things could surely be optmized also since virtio allows very easy zero-copy buffer passing.